Where do I start??!! Even if you are new to costuming you will soon hear about Costume College, the 3-day event hosted by the Costumer's Guild West, Inc. and held in early August in California. It has classes, events, socializing, tours, shopping, and fun! It has everything a costumer wants no matter your passion. People come from all over the world! I truly believe that every costumer should attend at least once. It is a memorable experience! I wanted to attend Costume College to meet the wonderful people I've met online; the seamstresses, bloggers, people who inspire and share, and who participate in this fun world of history and fantasy. I also wanted to completely immerse myself in the events and socializing and pure enjoyment of wearing the costumes I've spent hours creating. There were 5 events where costumes could be worn although many wore them throughout the weekend. 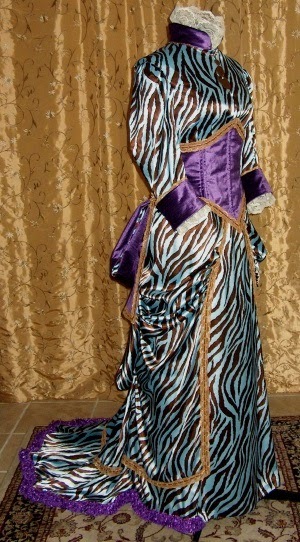 Kay, my friend and Costume College roommate, is a wonderful costumer and accomplished seamstress. Kay and I and our husbands have taken the Victorian Dance Cruise together and Kay participates in costume events monthly. Since she operates her own antique mall (lucky lady!) she doesn't have much time for sewing or planning. Kay and I talked just briefly about our Costume College plans and I made some of my costume decisions based on what she was bringing. Since Costume College has been held for over a decade there are many people who know each other well and even plan mini costume themes for the events. Not to worry! Whatever you wear you will fit right in and you will have the time of your life! 1. Always buy more fabric and trim than you think you will need. 2. Always have a back-up costume so that you don't get stressed out when time gets tight or plans change. 3. Create costumes that truly inspire you so they have more possibility of getting finished. Getting ready for Costume College was a serious practice in #2. Kay had decided to wear her Victorian Bathing Suit and since my flight was arriving late Thursday I needed something that I could put on right out of the suitcase. So what will I wear? In 2008 I was inspired by this plate in Victorian Fashions & Costumes From Harper's Bazar 1867 - 1898. It is a beach and bathing dress scene from the cover July 4, 1885. The costume on the left inspired me to re-create it even though I had no plans or place to wear it at the time. Simplicity 2890 was my base pattern. ...and thought it looked like a modern-day baseball cap. I made a muslin mock-up of a cap that could slide over a baseball cap and tie on. And here was the final style. Since I had no plans to wear this costume, when someone wanted to buy it from me I sold it and shipped it away. When I was going to the Victorian Dance Cruise and needed a Victorian Bathing Suit I wrote the purchaser and asked her if she wanted to sell it back to me. She hadn't worn it, I bought it back, and packed it into storage when I took a new position out of state. When the Cruise happened I couldn't get it out of storage, and bought a ready-made VBS. So after all this time....after all the travels....the multiple owners.....this little costume got to be worn and enjoyed at Costume College 2014! Even though my airport shuttle was late, and I was late, I still had a great time with the other ladies who chose Victorian bathing suits! Friday was a heavenly day! I toured the FIDM Museum spending time in the Helen Larson Exhibit of corsets/stays and the silhouette created for different gowns, the television costume exhibit including all the gowns and uniforms/suits from the court scene of Downton Abbey, the archives where I saw the workings for the 2018 exhibit, and many other stunning and educational items. I could have gone home that day and felt that my trip to California was worthwhile! But, of course, I have an evening event! The Ice Cream Social - Club Ice where "For two hours only, Salon F will magically turn into Club Ice, the hippest place in this or any other galaxy. Wear your most outrageous party outfit..." Sounded perfect for the most outrageous outfit I have ever made - my Avatar inspired 19th century gown made for an online costume contest in 2010. In James Cameron's movie (part 2 due in 2016!) 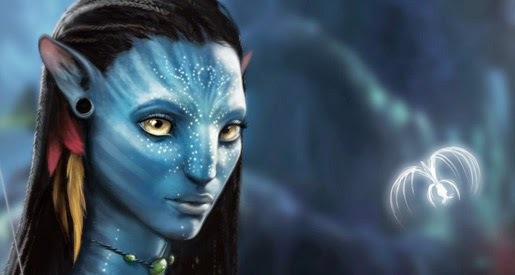 The Na' vi are a peaceful race who are forced to defend their planet and lifestyle from invaders. They are blue-skinned with zebra-type markings and glittered lines over their faces. The thought behind this costume was - What would Neytiri wear if she lived in the 19th century? It should, of course, be from the Natural Form Era, with colors she would love. 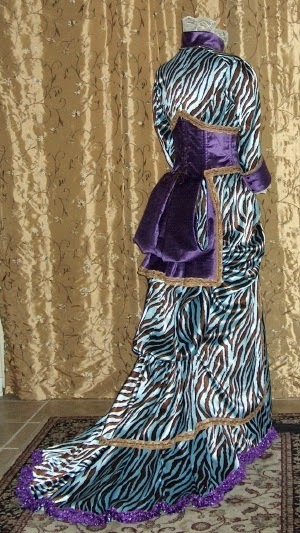 ...and this was the final gown. And like the Victorian Bathing Suit, this costume was finally going to be worn! The theme of the 2014 Costume College was Finishing Touches: The Art & Craft of Accessories. I'm a huge fan of and believer in accessories. They provide the perfect touch! (This is why this blog is called The Perfect Touch!) I believe in accessories from head to toe! For the Club Ice event I create some ice by adding crystals to a plain banshee-inspired tiara and wearing the tiara with a three chain rhinestone headpiece and purple braided hairpiece. Neytiri is a pro with a bow, so I added feathers and satin ribbon to a child-size bow and arrow which could hang from a chatelaine. Down to the toes....with purple suede shoes with some bling added and zebra-inspired stockings. Ohhh, look at all those Club Ice shoes! Here is the complete Avatar gown for the Ice Cream Social. What you can't see is the gold eyeliner (the Na' vi have gold eyes) and the blue shadow markings on my face. Make up, the ultimate accessory! Kay had purchased early entry into the Marketplace and headed there while I was dressing. You can see that the corselet laces up the back and even though I started the lacing with the corselet on backward, when I tried to turn it around something was wrong and I was stuck! Never fear at Costume College! I headed downstairs and asked the first costumers I saw to help me which they graciously did! If you are reading this - Thank You, again!! You are the perfect example of the wonderful people who attend Costume College! Kay and I end our first full day at Costume College in smiles! Part 2 Saturday will be next! Your Na'vi gown was amazing but I never was close enough to see the details loved reading the story behind it and your other costume. Oh Jeanette! I LOVE your bathing suit and hat!! What fun! I wish I could have seen it in person along with your fabulous Avatar dress! Oh to have seen it in person...I love make up touches with fun dresses such as yours...as well as fabulous accessories! Well you look fantastic!! Thank you, Gina! The bathing suit and hat were totally fun and the story is too, I think. We completely missed each other on Thursday, and then Friday after I popped in to your class I didn't see you any more that day. I missed your 1950s dress and your 1930s! I so wanted to see those in person because, as we know, pictures just truly aren't the same.